Homeowners may feel right at home when they walk through their front door, but that doesn’t mean they really know what they’re walking into. 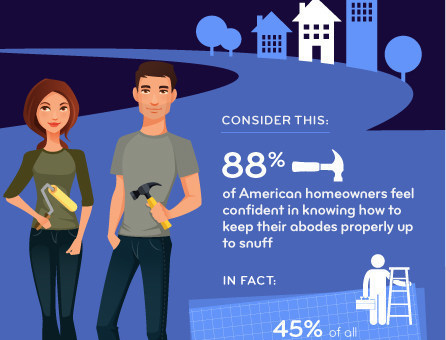 Consider this: 88 percent of American homeowners believe they’re knowledgeable about how to maintain their current home – but there are major gaps when people are asked the specifics, according to a new survey by Wakefield Research for Esurance. The survey polled 1,000 U.S. homeowners on knowledge of their home’s maintenance systems, insurance policies, home improvement budgets, and DIY skills. The key takeaway: American homeowners aren’t as savvy or proactive as they need to be with less than 40 percent regularly maintaining their home, which could lead to costly repairs or insurance claims in the future. Are you a home maintenance maven? New survey from Esurance finds gap in how much homeowners know. Taking care of a home’s exterior gives it curb appeal and prevents expensive repairs. But American homeowners don’t have a regular maintenance plan for many major features of their home, including: exterior foundation (74 percent), condition of their property lot (69 percent), and exterior surfaces of their home (66 percent). Homeowners also ignore regular maintenance plans for their home’s interior. This includes the attic (80 percent), the basement (77 percent), and the condition of interior walls and floors (69 percent). Lack of knowledge about key aspects of home maintenance isn’t stopping many from tackling DIY projects. Forty-five percent of American homeowners believe they are better at maintaining their home than a professional would be, including 59 percent of millennial homeowners. It may sound like it will be less expensive, but here’s why a DIY project can end up costing homeowners more in the long run. 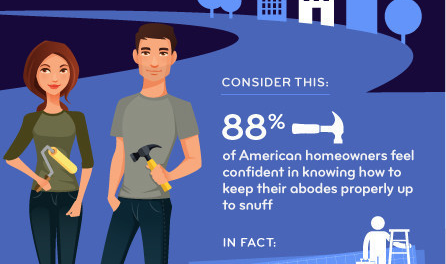 Among American homeowners who have tackled a home project by themselves, 52 percent have needed to hire a professional to fix a DIY project – and this includes 78 percent of millennial homeowners. Esurance, insurance for the modern world®, provides auto, homeowners, motorcycle, and renters insurance direct to consumers online, over the phone, and through select agents. With an easy-to-use mobile app, helpful online tools like photo claims and Coverage Counselor®, and knowledgeable experts available around the clock, Esurance is the smart choice for today’s web-savvy consumer. And as a member of the Allstate family with an A+ rating from A.M. Best, Esurance offers auto and home insurance anytime with service just a click, call, or tap away. For more information, visit esurance.com or call 1-800-ESURANCE (1-800-378-7262).